It’s three in the morning and we’re out walking the streets of Whitehorse. The darned sun just won’t go down. Our minds have been fooled by a ‘Yukon blue’ sky that won’t fade to black and we are wide awake. Our inaugural trip to Canada’s romantic north involved four jam-packed days – enough to get a good taste of this storied territory and leave us thirsting for more. On day one, I hopped an Air North flight to Dawson City while Toque jumped a vintage train to Skagway, Alaska on an expedition to cross the famous gold rush trail through White Pass. My coolest memories of Dawson City – which draws about 60,000 visitors annually given its synonymous status with the 1898 Klondike Gold Rush? – Meeting a gold nugget-loving miner named Jim Archibald who’s been panning since the 60’s. He actually let me hold a small leather pouch containing about $23,000 worth of solid gold nuggets – never taking his eye off the prize, of course. Can you say “really heavy”? – Touring past Robert Service‘s cabin – and remembering the poem “The Cremation of Sam Magee” that I, like so many Canadian children in elementary school, was made to memorize. – The sweet fragrance of beautifully beaded, smoked moose hide moccasins – handmade by local First Nations artisans and for sale at the Danoja Zho Cultural Centre. As for highlights from Toque’s train trip to Alaska? – The bus trip back to Whitehorse which included a visit to the town of Carcross – previously known as Caribou Crossing – which sits beside Bennett Beach, said to be one of the top beaches in Canada. Easy to imagine this sandy mecca teeming with Coppertone-covered teenagers come summer. – The Carcross Desert – found along the South Klondike Highway. At a mere 640 acres or one square mile, it’s considered to be the smallest desert in the world. These out-of-place dunes are used by locals for sandboarding. Who knew? After rallying back in Whitehorse, we were – naturally – on a quest to find gold and the saloons in town were only too happy to oblige. Mackenzie, our ruggedly handsome and yes, burly bartender at the Gold Rush suggested a couple of pints of Yukon Gold. Yukon Brewing calls it “beer worth freezin’ for.” It was. After a long (and I mean long) day, we had indeed struck it rich! 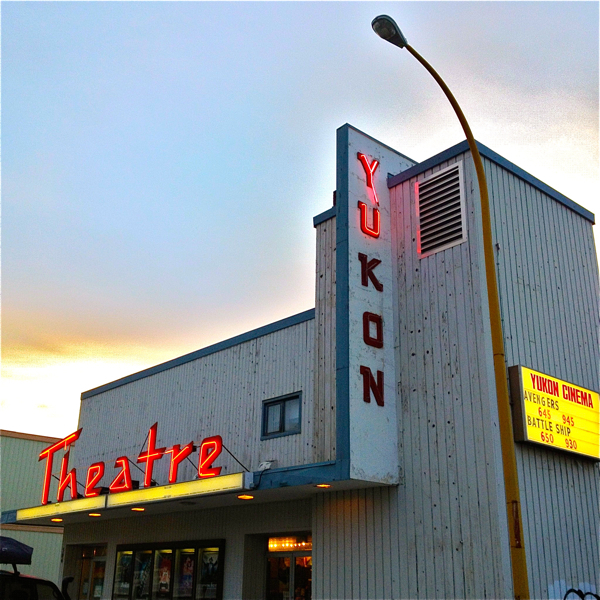 Whitehorse, the Yukon’s capital, is home to 25,000 permanent residents – also known as ‘sourdoughs,’ a moniker going back to prospecting days when miners carried pouches of sourdough starter on their belts. They say since the Gold Rush era, the Yukon has attracted ‘interesting’ characters. We can assure you this is true. At our local saloon, there was the lovely, grizzled old guy we nicknamed “Shorty.” Sporting a permanent smile and holding court – pint in hand – at his favourite window table, he proudly wore demin short-shorts, well-worn cowboy boots and a tattered cowboy hat. Don’t even ask us about Mr. Pajama pants! There were also the usual suspects – the plaid-clad and bearded saloon dwellers who seemed gruff until later in the evening when ready smiles emerged in even proportion to beers downed. And let’s not forget the other 95 per cent – Canucks who could live anywhere but who have chosen to make the Yukon home. No question, there is something about this land. This is a place of fierce beauty, a place where you can find that rare I-am-but-a-speck-in-the-wilderness feeling. Now if you ask us, that’s rich. Toque and Canoe provides a wonderful glimpse of the Yukon and it’s treasures. Visits to the cultural centers would be at the top of my list to see the beautiful functional and artistic works created by people whose ancestors lived in that area hundreds if not thousands of years ago; the Carcross Desert and and the beautiful Miles Canyon would be next and, of course, a “must” would be a visit to Robert Service’s cabin. Met a wonderful First Nations man there nicknamed “Boom Boom” and bought one of his moose antler carvings. Great selection of locally-crafted souvenirs and worth checking out! This article makes us want to pack our bags and head to the Yukon right now! Hey Monica. We know exactly who you need to talk to. We’ll e-mail you personally on this! Kim passed your request on to me – we met during a recent media event hosted in Yukon and I have been a fan of toque and canoe ever since! My disclaimer up front, is that I work for the Department of Tourism in Yukon on the Marketing team, so you may detect some bias…. Your vague rumours are reality. Both Yukon and NWT promote Northern Lights/Aurora Viewing as a key winter tourism product.The prime viewing period in winter is from November – March – but viewing is available from August through April. In Yukon, we are promoting fall color aurora viewing which is becoming extremely popular, particularly for those that are apprehensive about -20 to -40 that can happen during the peak winter viewing period. Most of the operators offer a three night package. This is simply because the probability of seeing the aurora runs at over 90% if you stay for three nights (i.e. could be cloudy one night). Last year was incredible as the Aurora is currently in a peak cycle and success rate last season was about 97%. Plan to view late at night – normally tours are out from 9:00 pm to 2:00 am. Both NWT and Yukon offer great aurora viewing product and operators. The main difference is that the operators in Yukon are smaller, group sizes are smaller and the Yukon aurora landscape is backdropped by mountains. Yukon offers a range of accomodations and experiences from standard hotel rooms to lodge stays including spa treatments (my wife’s favorite). Many visitors add on other activities to their Aurora experience including dogsledding, skiing, scenic drives, festivals and events. Not sure where you live, but in the winter Whitehorse is serviced by Air North – Yukon’s Airline with jet service out of Vancouver, Edmonton and Calgary; Air Canada flys multiple daily flights out of Vancouver; and West Jet flys seasonally but their service does capture the fall aurora viewing season. Thanks for your interest in Aurora Viewing! Thank you so much! Denny you have inspired idle rumours into an action plan – we look forward to booking our exciting introduction into Canada’s northern playground soon. I was actually hoping for a Winter opportunity anxious to also experience the dog sledding and snowshoe trails. It’s like turning our favourite Ted Harrison painting into our own reality! Thanks Toque and Canoe for doing what you do so well- helping us make the transitions from post cards to real personal photo albums! I spent a lovely 10 days in the Yukon and NWT 10 years ago and your post brought back ton of memories. Cannot wait to take my kids up in a few years!